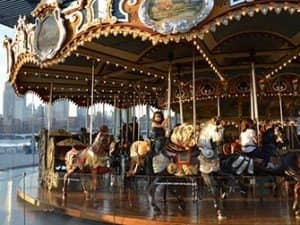 Jane’s Carousel in Brooklyn is a beautiful authentic carousel, situated in a square glass building. This way you can always take a ride, rain or shine. Go with or without kids. Yes indeed, Jane’s Carousel is a ride for all ages. Nobody will give you a funny look when you hop on as an adult, so don’t be shy and do take a ride – it’s only $2. The area around Jane’s Carousel is also called DUMBO: Down Under The Manhattan Bridge Overpass. The area was hit severely by hurricane Sandy in October 2012. The hurricane also flooded Jane’s Carousel – originally from Youngstown, Ohio, just one year after it’s opening. 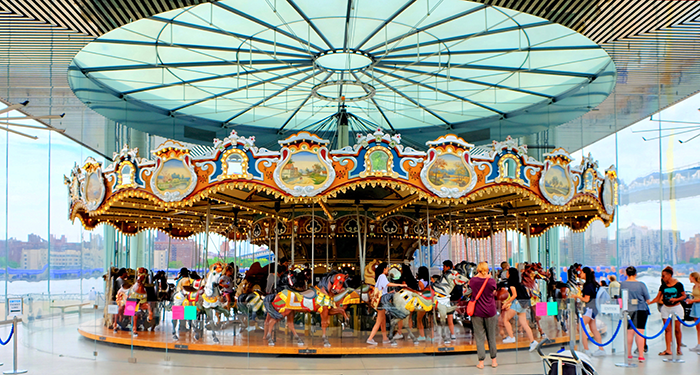 Luckily, the damage was quickly restored and the carousel is more beautiful than ever before. This remarkable object situated in Brooklyn Bridge Park even won a design award in the category ‘public space’. In fact, Jane’s Carousel consists of two unique buildings: both beautiful and very distinct at the same time – making it quite interesting as a whole. The detailed, authentic carousel dates back to 1922, and the minimalist, transparent cover designed by the Jean Nouvel atelier is from 2011. Its waterfront location further enhances this special effect. Not to even mention the beauty of it all when you’re visiting at night, when they illuminate the walls creating a light show you can see from across the East River and its Manhattan and Williamsburg Bridges. Planning to propose? This location definitely is romantic!